American Sac Spider is a species of spider known by the scientific name Cheiracanthium inclusum. They are perhaps best known for creating sacs for their eggs and sacs for themselves where they can rest. 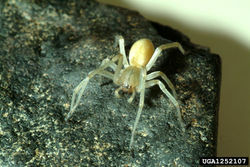 The typical size of an adult female American yellow sac spider ranges from 7-10 mm; while males range from 5-9 mm. With a total of eight eyes when viewed from the front, there are two horizontal rows of four. All eight eyes are circular and are relatively all the same size. For the size of the yellow sac spider its legs are proportionately long, particularly in adult male specimens. The legs are usually the same color as the rest of the body. “Toes” of the spider may appear black, because of the dense hairs beneath the claws. The tarsal pad on the spider permits them to climb smooth surfaces. The tarsi ( the tips of legs) have 2 claws on each leg. The cephalothorax and abdomen are about the same length, although well fed or pregnant female spiders have a very large abdomen. The abdomen has an oval shape and tends to be widest in the middle. The spinnerets are usually visible when the spider is viewed from above. Both the male and female have similar coloration ranging from shades of pale green, tan , or yellow. After Mating, female yellow sac spiders lay about 30 to 48 eggs in autumn and the spiderlings emerge during the upcoming spring. Those eggs are layered in a loose mass and covered in a thin coat of spun silk.The sac spider separates her eggs into 5 different sacs. The egg sacs are hard to see because of the thin layer surrounding them and are often overlooked by most people. In homes the sacs can be found along ceilings, corners, or even behind pictures and shelves. Outdoors the egg sac may be found in protective areas such as wrapped up in a folded leaf. Unlike some spiders the American yellow sac spider may guard her egg sacs until the eggs hatch. In the hottest months, small spiders make up the largest proportion of the spider population. Throughout all stages of the sac spiders' life they are able to make a silken cell (the “sac) where they rest when inactive. The typical adult American sac spider lives out its life stalking up nutrients, hunting prey, mating, and creating webs. American yellow sac spiders are known to form silk tube-like sacs within man made structures, hiding in the tubes throughout the day. To create a sense of protection the sac spiders may roll themselves up in leaves or other debris lying around during the day. This species of spiders inhabit various places including trees, forest floors, and agricultural areas. However as the temperatures drop they are known to find refuge indoors in search of food, climbing walls as a defense mechanism to avoid predators. Because of that the sac spiders commonly build their nests in high places, in the upper corner of a room, behind picture frames on the walls, above window molding, or even behind drapes and blinds. 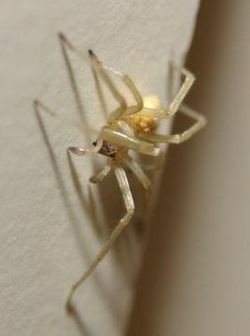 People are most often bitten at night while male spiders search for food or mates. American yellow sac spiders prey on various different species, some being leaf hoppers, fruit flies, eggs of lepidopterans. They have even been known to prey on other spiders such as the Anyphaena pacifica and Theidion melanurum. Aside from the sac spiders' predatory diet they also consume nectar as they search for food. Strangely enough, the nectar consumption elevates fitness through increased survival, growth, more so during periods of prey scarcity. ↑ Cheiracanthium inclusum Wikispecies. Web. Last modified on July 25 2009. Author Unknown. ↑ Mruphy,Drew. Cheiracanthium inclusum ‘'animal diversity.Web. Accessed January 20, 2014.